Evening Primrose is most popularly known in its seed oil form frequently sold in health food stores for its high gamma-linolenic acid content. While I’ve seen the commercially produced oil be very useful for many people, what I’ll be talking about here is the whole plant, including leaves, buds, blooms, roots and seeds. It is a common plant from India to Europe to North America with a long history of folk use and quite gentle, yet effective, in application. 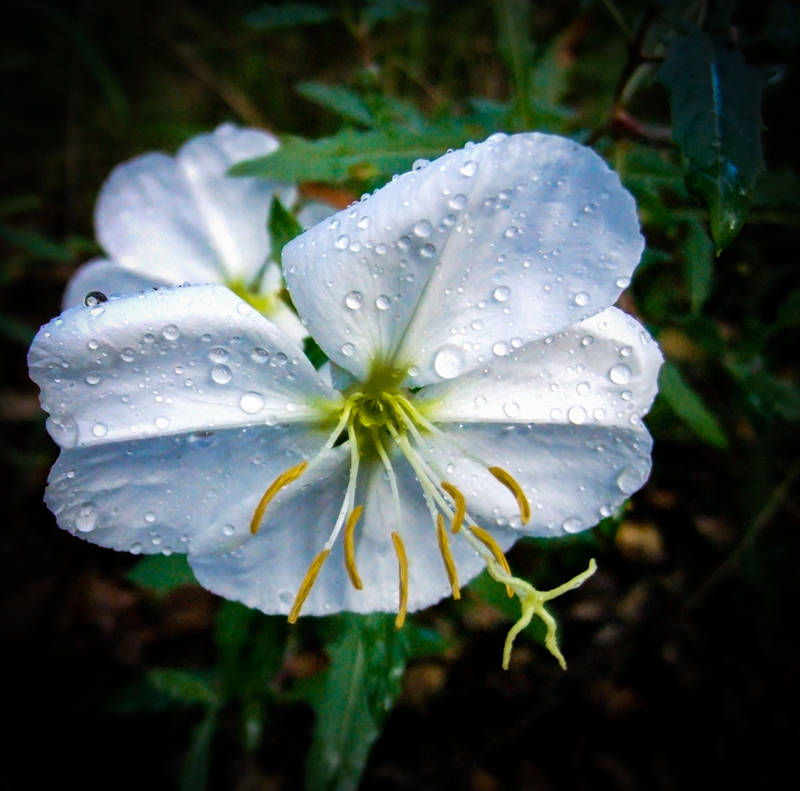 We’re blessed to have about six different kinds of Evening Primrose here in the canyon, but the most commonly used medicinal species are the upright biennials. I use which spp is most common at any given time and they all seem to work wonderfully. This year the white species is especially prolific, carpeting meadow and roadside with a soft white luminosity that begins in early evening and continues through the night into the morning. Very much a moon plant, this beauty seems to shine with its own light in the dark, and when the petals are pressed, they become tinted with an iridescent rose blush. This is an energetic medicine for the solar plexus and heart, balancing receptivity with expression and allowing us to open fully to love without fear of rejection or betrayal. I believe that Evening Primrose is an excellent tonic for what Michael Moore calls Adrenalin type stress where the GI, liver, skin, reproductive system and kidneys tend to all be deficient but the nervous System and musco-skeletal are in excess which leads to eventual burnout and chronic digestive disorders, often accompanied by pelvic congestion. This is a gentle, neutral remedy that can be used over a long period of time without adverse effects. Certain species are more bitter than others and I prefer to use the non-bitter white flowering type here for most uses, and reserve the slightly bitter plants for more heat clearing, stomach stimulating purposes. Matthew Wood associates this herb with a rare class of medicines he calls balsams, that have such an evenly balanced blend of energies and tastes as to be nearly neutral and gently stimulate the solar plexus and revitalize the whole body. Other herbs of this class include Lemon Balm and St. John’s Wort. Note that both of these of plants, like Evening Primrose, are very useful for both anxiety and depression and significantly effect both the solar plexus and the heart. These are balancing remedies for the mind, spirit and body. Outside of these tonic uses, Evening Primrose is definitely useful for simpler cases, such as any spasmodic cough, asthma, belly distress of varying kinds and causes, menstrual/muscle cramps, joint/muscle pain and all sorts of wounds. David Winston has introduced the use of the leaves as a remedy for GI related depression, and the fact that GI problems are the root of many peoples’ depression makes this is an incredibly useful remedy. As a nervine, it is potentially very effective, but not all respond to it immediately, and sometimes prolonged use is necessary to take advantage of it deepest benefits. It can be a most useful calmative, especially suited for nervous exhaustion, hormonally oriented irritability and depression and anxious, tense children. It is of an uplifting character, and useful in cases of mild to moderate depression, most noticeably so when associated with exhaustion, addiction withdrawal and chronic digestive issues. Evening Primrose definitely soothes the stomach, especially in tea form, being relaxing, antispasmodic, slightly astringent and somewhat mucilaginous, very healing and gently tonic. This is an ideal remedy for dyspepsia with gastric inflammation, a large, coated tongue and an overall sense of gloom. It is especially useful where there is a spasmodic cough/asthma and/or pelvic fullness and reproductive irritation. Clymer wrote that it is indicated when a person had been consuming a bad diet over a long period of time that resulted in toxins accumulating in the digestive system. This kind of diet often negatively affects the liver as well, and Evening Primrose is indicated both in modern research on the seeds as well as through traditional usage of the whole plant for a debilitated or sluggish liver. It is excellent for uterine/ovarian cramping for many women, either an infusion or tincture of the whole plant including roots and budding, flowering and seeding tops. Also helpful in the intestinal distress that often accompanies such cramping. Great for chronic reproductive inflammation and pelvic congestion, especially when used long term. A prime nourishing infusion herb, restorative to the nerves, reproductive organs, GI, kidneys and lungs with its greatest affinities seemingly aligned with the reproductive tract and lungs. I also use Evening Primrose in many of my lung tonic formulas, and consider it nearly as essential as Mullein for such applications. It has a history of use in bronchitis, asthma (especially with digestive involvement), pneumonia, whooping cough and similar lung ailments. I find it useful as a soother and antispasmodic for the lungs, and a wonderful addition to Mullein, Rabbit Tobacco and other gentle lung tonics, especially as it is not as drying as many common lung herbs are. There are some older references to using Evening Primrose in glandular fullness, and it seems to be a gentle lymphatic along the lines of Violet, though less cooling in temperature. A nice way to ingest the plant is to grind the dried root (or whole plant) to a fine powder and mix with warm honey, take by the tablespoon for sore throat, spasmodic coughs and similar situations. This is especially nice for small children and other picky patients. Combine the Evening Primrose with Rose, Anise or Fennel and a tiny amount of Osha or Balsamroot for an especially nice syrup. The seeds are a traditional food, and contain a goodly amount of essential fatty acids. You can pay a pretty penny for the extracted oil in health food stores, or you can collect the seed, crush it and add it to flax seed oil or some other EFA rich oil, keep it stored someplace cool of course, or make as needed. The leaves are usually mild, mucilaginous and slightly peppery and make a lovely addition to salads and stews. The young roots (I emphasize young, the older ones are as tough as twine) can make a tasty vegetable, depending on the species, and growing conditions, when boiled or used like parsnips in food. It especially excels as a vulnerary and has been reported as having previously been utilized for snakebite, spider bite, swellings, bruises, wounds and all sorts of insect stings/bites and other irritations. Modern use confirms these uses, and my own experience has found that a spit poultice of the leaf is amazing for many wounds and bites, the salve or fomentation is also very useful, and the plant in all its preparations and forms are necessary items in my practice. I've used tincture (flower, bud, seedpods, leaf and root) on infected wounds, venomous insect bites and stings and even a few rashes with wonderful results. The redness clears, everything heals up without a fuss and VERY rapidly. It's really quite impressive, and is now up there with Cottonwood, Sage, Rose, Yarrow and Plantain as my favorite first aid plants for infection, venom, irritation and slow healing wounds. Cautions: This is really a very gentle and safe herb at the proper dosage, but research suggests that the refined seed oil should be used with caution in epileptic patients or those who routinely experience seizures. note: 1 Part Elm or Mallow could be added or substituted for the Cherry for extra moistening effects.